These Gardner Bender low-voltage coaxial cable staples feature UV-resistant polyethylene saddles able to withstand both indoor and outdoor applications. Zinc-plated nails resist rust and corrosion and feature a sharp tip for easy starting and to reduce cracking and splintering of wood during installation. One nail per staple facilitates a quick hammer installation. Designed to secure RG-59 and RG-6 coaxial cables to wood. The Gardner Bender Plastic 3/4 in. 1-Hole Cable Clamps (6-Pack) feature durable crack-resistant construction that's safe for use in indoor and outdoor applications. Includes 6 clamps. Polypropylene clamps hold harnesses, cables and tubing. Used for construction, maintenance and assembly-line operations. Position at desired location, insert cable or tube (not included) and then fasten with a screw or nail (not included). Gardner Bender offers superior product performance with our wire management items. Our items feature contractor-friendly designs to ease installation, resulting in both time and money savings. In addition, Gardner Bender offers the widest array of accessories in the industry for a one-stop shopping experience. When wires become entangled they are safety hazards, for both the equipment and the owner. Gardner Bender offers a variety of products for protection and neatness. As the needs of professional electricians change in managing wire and cable, Gardner Bender continues to deliver innovative solutions. Assorted Heat Shrink Tubing kit contains 160, 3-inch tubes in a variety of pre-shrink to post-shrink sizes. Gardner Bender Heat Shrink Tubing provides abrasion and moisture protection for electrical wire and cable. Kit includes: 60 - Size 18-20 AWG 1/16-inch pre to 1/32-inch post tubes, 35 Size 28 - 26 AWG 3/32-inch pre to 3/64-inch post tubes, 25 Size 22-18 AWG 1/8-inch pre - 1/16-inch post tubes, 20 Size 20-12 AWG 3/16-inch pre to 3/32-inch post tubes, 10 size 10-18 AWG 1/4-inch pre to 1/8-inch post tubes and 10 Size 12-4AWG 3/8-inch pre to 3/16-inch post tubes. 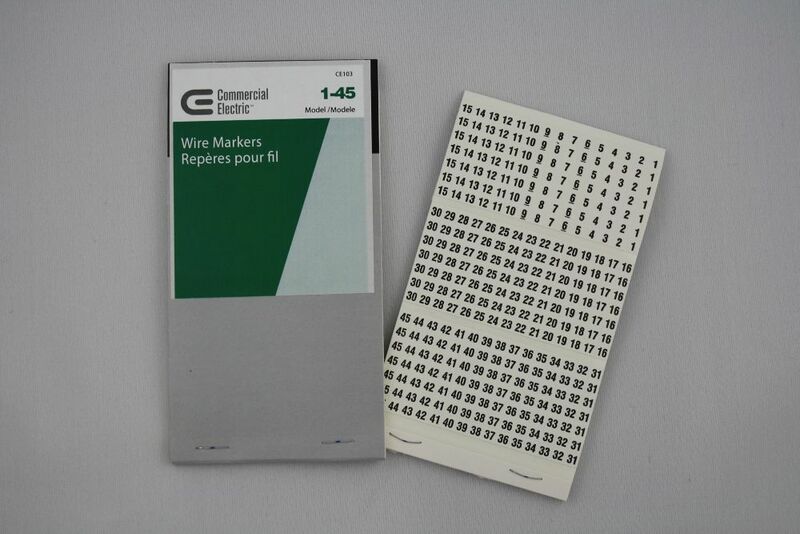 CE Wire Markers 1-45 Put this in your pocket! The non-smear black legend ensures high visibility, and the self sticking adhesive is compatible with wire and cable.